It must have been a wonderful adventure, those early days of pioneering SMP – Imagine it, taking it from an idea to a treatment would have involved some real moments of drama. The first dots being placed, then the wait while they watched to see what would happen to those dots. Like planting a seed and waiting for it turn into a flower it would have required patience. Laser would have been needed, plenty of times while they worked their way through different needles and techniques. It would take around 5 years of experimentation and learning before it was considered ready to take to market… and has been changing lives for the better ever since. The number of sessions required to achieve perfection was one of the very first questions that needed understanding. Clearly it would not be one. You should expect to receive a full coverage, a first coat if you like. It will form the initial layer and crucially inform the practitioner on how to proceed for the second. Immediately after treatment the dots will appear slightly larger than the size they will eventually settle to. Scabs will form, very small scabs which will heal and fall away very quickly. During this time you will need to follow the aftercare guidelines carefully. They are essentially the advice you would be given for any wound, cleaning gently etc. In addition, you will be told to avoid sweating excessively and direct sunlight… as if you were a vampire. Before the second session starts the practitioner will make a complete assessment of the results from the first. Small patches may have seen accelerated fading compared to the surrounding scalp for example. 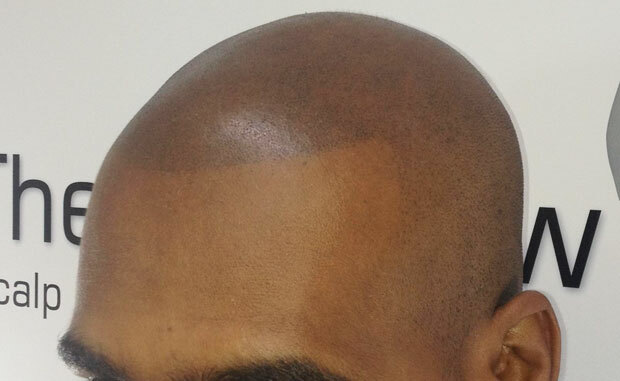 Equally the client may decide, having worn it for a week, that they would like a slightly different hairline. Once agreement has been reached on style and density the work can start. This time it will involved adding another layer, good practice is to use a couple of different but very similar pigment shades… often described as the 3D effect. For some that is the end of their treatment journey, but even a two step treatment can have bumps in the road where that first of week fading can be terrifying… the client convinced it is a disaster. The second will usually calm things down, though not every time by any means. A good clinic will offer a package of treatments that reflect the full spectrum of treatment journeys – so that if you do require 3, 4 or even 5 sessions to complete there are no escalating costs to worry about. If anyone tells you they can achieve a perfect SMP in a single session you can be sure something is wrong – They will be looking to charge you for the additional sessions or they are using wholly inappropriate pigments. Either way, your due diligence and research should highlight rogue clinics. If you want to check the results of your investigations, or any SMP related question you might have, with us send us message to info@smpdebate.com, we will be delighted to hear from you and happy to help.